IMPORTANT! Because cloud sites are basically shared server sites, many Control Panel functions are NOT directly available/accessible to individual domain authorized users. Please contact CSN Support at CyberCenter@CyberSite.net to request help in migrating to PHP 7.2 on Cloud Sites IF your website control panel does not allow you to make the change yourself. Please read the following article to help you easily migrate cloud sites to PHP 7.2. It is critical we stay up with Industry standards. 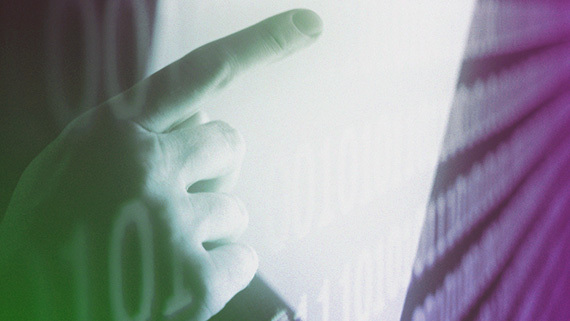 Features, security, and functions continue to progress as software matures. In addition, development communities, which provide the backbone of modifications and updates on software, focus on the latest version and eventually reach a point where they no longer provide updates to specific versions. PHP 5.6 and 7.0 have reached their end of life and security will no longer be patched and supported after December of 2018 (for more information about End of Life products, see What Does End-of-life (EOL) Mean for Me?). Because of the inherent vulnerabilities of unsupported software, we must remove these versions from our platform. To learn more about the supported versions of PHP, see PHP Supported Versions. With the upcoming move from PHP 5.6 / 7.0 to PHP 7.2, we want to prepare you by spreading awareness of deprecated code or code changes to help you prepare for making changes on your websites. Cloud Sites will not support/process PHP 5.6 and 7.0 beginning February 2019, so please make sure you have thoroughly tested and updated your site(s) to PHP 7.2 technology BEFORE the the beginning of February. mcrypt: The mcrypt module was deprecated and removed in 7.2. See mcrypt. The mcrypt library supported a wide variety of block algorithms such as DES, TripleDES, Blowfish (default), and other cipher modes. Since the mcrypt library has not seen any updates since 2007, it was marked as deprecated in PHP 7.1, then removed from PHP 7.2. The alternative solutions for block algorithms are openssl and sodium modules, which are provided in our PHP 7.2 installation. For more information on these alternatives, see OpenSSL and Sodium. memcache: This feature was deprecated and removed in 7.2. For sites using memcache for caching or session handling, Cloud Sites has begun using the current feature memcached (with a "D") extension instead of the memcache (without a "D") extension beginning with PHP 7.0. For more information, see memcached. xmlrpc: The xmlrpc extension is not enabled by default in PHP. However, it was included in the Cloud Sites PHP installations up until PHP 5.6. While we're removing support for it in PHP 7.0 and beyond, there are several other modules and extensions that offer support for XML. The xmlrpc php interface in WordPress is still valid. ZendGuard Loader: The developers have not added Zend Guard to PHP 7 (see Zend Guard and PHP 7). All PHP installations on Cloud Sites still provide the ionCube Loader for customers who would like to have PHP encoding available. imagick: The imagick version will be moving from 3.2.0RC1 to 3.4.3. There were bug fixes that were implemented. For a full list of changes, please refer to the changelog. MSSQL: For those sites connecting to MSSQL databases, PHP 5.6 marks the end of life for the MSSQL functions. Going forward, it's recommended to use the PDO_ODBC driver, which exists in our PHP 7.2 installation. PDO_ODBC also exists in the current PHP 5.6 installation, which means that you can test replacements without upgrading technology versions. MySQL: For those sites connecting to MySQL databases, PHP 5.6 also marks the end of the MySQL functions. These functions were deprecated in PHP 5.5 and removed completely in PHP 7.0. It is recommended to use either the mysqli or PDO_MySQL extensions, both of which are provided in our PHP 7.2 installation. These replacements also exist in our existing PHP 5.6 installation, which means that you can test replacements without upgrading technology versions. Many customers use Content Management Software (CMS) to maintain their sites. Below is a partial list of the most commonly-used CMS’s in Cloud Sites and their compatibility with PHP 7.2. WordPress. Compatibility of PHP 7.2 was officially added to WordPress with 4.9.3, which was released February 5th, 2018. Third party plugins and extensions will have their own release cycles, so you will need to check the developer's documentation. Joomla. Compatibility of PHP 7.2 has technically been available since 3.8.0, but they're still working on PHP 7.2 compatibility fixes as of 3.8.6, and the Joomla developers themselves still recommend updating to PHP 7.1 instead of PHP 7.2. Drupal: Compatibility of PHP 7.2 was officially added as of Drupal 8.5.0, which was released March 7th, 2018, and is the recommended version from that release forward. 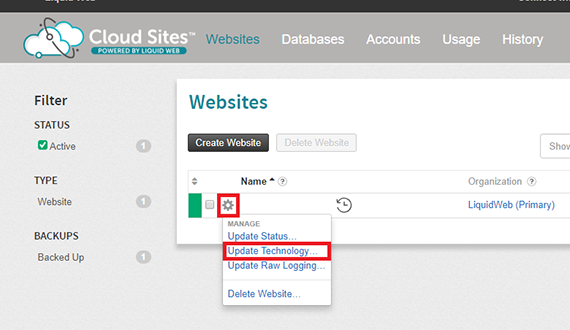 After your testing is completed and your website works with PHP 7.2, you can update the technology of your website via the “Update Technology” option in the Cloud Sites control panel. NOTE. When you update the technology of your website to PHP 7.2, you cannot roll back the PHP version. If you have any questions, please reach out to our Heroic Support Team. Open your Cloud Sites Control Panel and click on the Settings wheel next to the site you want to upgrade to PHP 7.2. Then click Update Technology. To do so — open your Cloud Sites Control Panel and click on the Settings wheel next to the site you want to upgrade to PHP 7.2. Then click Update Technology. Note: Your personal Website Control Panel may not have a "widget" to use for selecting "change technology." To change technology, just click on the website name to open your settings panel. Next, open your Cloud Sites Control Panel and click on the Settings wheel next to the site you want to upgrade to PHP 7.2. Then click Update Technology.